Drama. The Street has noticed that there are handful of companies that have been aggressively buying in their own stocks at low prices because nobody else will – that is, the institutions aren’t buying them and they likely won’t as long as the “bond door” remains open (The Street, October 8, 2013, Jim Cramer: Where to Buy on Cataclysmic Days). Alas, the institutions have a lot of money but only three ideas: work a smaller cap stock (less than $10 billion or so) by “taking a position” (long or short); work the “spin” from bonds to equities to bonds; or “walk the line“. Most of their money (which was our money as savers and investors before we gave it to them to “manage” or “keep”, so to speak) is in “walk the line”, most of the time, and that explains a lot about “volatility“. The Street identified seven such companies – GameStop, Viacom, CBS, Time Warner, AOL, Wyndham Worldwide and AutoZone – that have bought in and kept or cancelled anywhere between 5% and 10% of their own stock in the last year, and so we put them all into one portfolio to see what has happened and what we might expect to happen next year. As it turns out (no surprise), instead of three ideas, there are three rules in portfolio management for risk aversion, capital safety and more “alpha”: they are selection, selection, and selection, which we’ve simplified into The One Rule so as not to confuse our customers. This portfolio has been entirely buy and hold since December and has returned +40% plus dividends of $2.2 billion for a current yield of 1.4%. And they have spent another $10 to $15 billion buying back their own stock that nobody else wants (sic). Please see Exhibit 2 and 3 below. It’s likely (ibid, The Street) that with the exception of Gamestop which is still working itself out of losses in 2012 (but which stock price has doubled this year), the PEs (price to earnings ratios) are simply too high (in excess of 20×) for alpha-seeking (“underweight/overweight”) portfolio managers and that they are waiting for lower prices or still higher earnings or both. 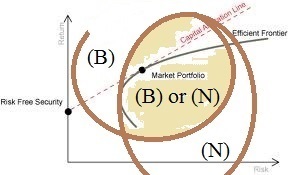 However, the “stock price” is notional and not related to anything (which is another reason for the “whale” instead of the “line”) whereas the “price of risk” resolves a Nash Equilibrium between “risk seeking” and “risk averse” investors and is itself a “risk-adjusted” price that moderates “high PEs” with the expectation that investors who are willing to buy and hold the stock at these prices believe, and have reason to believe by demonstration, that their money invested in the stock is “as good as cash and better than money”; that is, it is likely to provide a non-negative real rate of return regardless of the current stock price. Please see Exhibit 1 below for a calculation of the PEs and Yields (the inverse of the PE) with respect to the price of risk.